﻿We just got back from Phoenix, and I'm looking forward to sharing all about our trip over the next few weeks. But I'm still digging through laundry, email inboxes and all the other trappings of home life that await everyone upon return from vacation. One thing I'm very excited to share is that the arrow was a pretty good airplane passenger. I wouldn't rate him a perfect 10, but at a wiggly 18 months of age, I was shocked at how well he did. He even managed to doze off on both flights (and if you know the arrow, you know that he's a bit of a high maintenance sleeper and typically requires a dark room, comfy crib, and lullaby music--none of which you'll find on a plane). I'm sure I'll do a post or two on some tips and tricks we learned along the way. One of the reasons I love participating in Mondays are for Dreaming at The Mother of All Trips is that I spend some time each weekend daydreaming about adventures we've had or what's ahead. 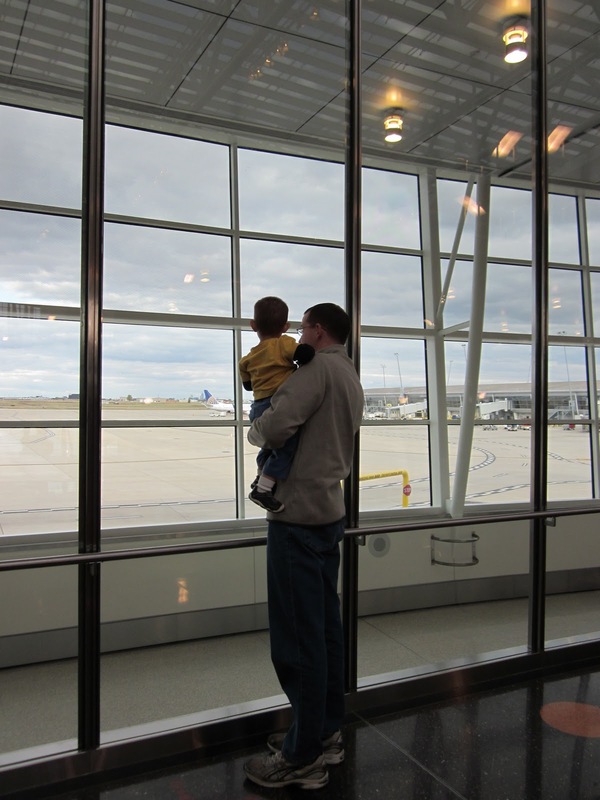 And now that I know flying isn't the parenting nightmare that I thought it would be, today I'm dreaming of far off destinations in the future for my little family. 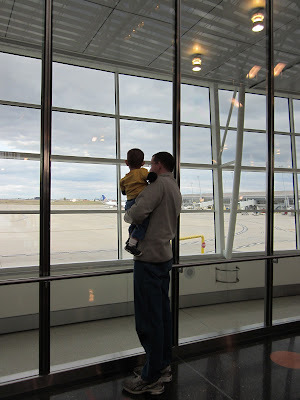 PS: The photo above was taken at the Indianapolis International Airport. If you haven't had the pleasure of flying into this relatively new terminal, you might be interested in reading more about its public art, which I wrote about at the Indiana Insider last week. So glad it went well and really looking forward to reading your tips. Euan's a bit of a high maintenance sleeper too, in fact that was the subject of one of my posts this week! Congratulations! That is quite an accomplishment. Hopefully your future flights will be just as successful! So glad your flight went well. My daughter is 3 1/2, and I think things get easier as they get older. She understands now that she needs to sit in her seat, wear her seatbelt, etc. As Mara said, at 18 months, they just want to go, go, go! Congratulations on your successful flight! Orange you glad it's fall! Before there was the arrow, there was... us. Going places strollers never will.